Delegates to last year’s meeting to discuss the provision of next generation broadband in West Sussex are likely to have left the meeting with the belief that towns served by three of the four BT exchanges in the UK that have not been upgraded to broadband-capable could not in fact receive broadband. This was and is not the case, as Kijoma’s Bill Lewis tried to make plain at the meeting. Kijoma’s coverage could and did and does cover them, according the green-shaded bits of the map here that Lewis has just sent me. For some reason, the official map prepared by West Sussex County Council does not reflect Kijoma’s coverage, although it is possible to discover Kijoma on the SamKnows site, as I did earlier with respect to West Chiltington. Not including Kijoma’s coverage may lead one to conclude that there is no broadband available to residents in those towns. But Lewis argues, strongly, this is not the case. So why does WSCC, and how many other county councils, not include existing wireless broadband coverage, when the official line is that wireless is one of the technologies that will have to be used to deliver broadband for all? « Why is there so much wrong data about NGA? Ian – I was disappointed to see your excellent and independent blog turn into an apparent 2-day advertising-fest for one WISP. There must be many Wisps (and satellite providers) in the same position – ignored – who should surely have your attention. 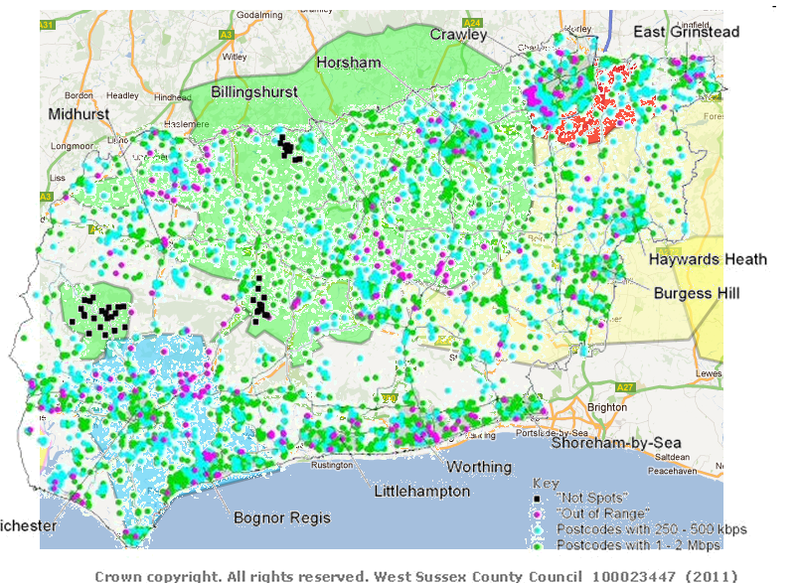 Regarding ‘the map’ – West Sussex CC are aware that there are now effectively NO broadband black-spots in the whole of the UK with the advent of satellite broadband. It is readily apparent that their map (which is of some vintage) was based on the ‘traditional’ fixed-line broadband availability and therefore ‘correct’. For ‘Somerset’ and others – beware – ‘SamDoesn’tKnow’ (as it is known in the trade) is known to be wrong here and there. The discrepancy on line lengths you see is because they are (only) 20 years out of date on where that exchange actually has moved to. They are also noticeably wrong over WISPS’ coverage. It behoves us all to strive to get the message out NATIONALLY that the way the BDUK broadband implementation is going will not provide the sort of broadband the country should have. 2Mb (minimum) everywhere by 2015? No ‘High Speed Broadband’ from BT for those more than 1200m by road from a cabinet? 22% coverage of connections available in Ewhurst? How to do this is the question. Efforts have been made to get the major media interested – no luck. If anyone has the ear of the media, pipe up now. Time is running out and £830mill is heading in the wrong direction. Mike – Please let me know the errors you are aware of with the SamKnows data and I’ll look to update it accordingly. We always welcome people updating us and assisting with any issues. We find that is more productive than people complaining, because I’m afraid we can’t always know everything! Hi Mike – this wasn’t meant to give undue coverage to Kijoma, but merely to use a specific case where a local broadband supplier is being ignored by his county council. Kijoma may be an isolated case, but that’s not what people tell me. As noted earlier, there is a real risk that BDUK will spend taxpayers’ money that will entrenching the market power of the incumbent at the expense of local suppliers who create local jobs, are more likely to spend their money locally, and are more likely to provide competition that will benefit consumers. Not sure Ian would see it as an “advert” for a WiSP, but unlike you at least he has not decided to ignore and remove Kijoma from the solution and instead pursue one dead end after another. Are the rest of your forum subscribers aware of how much this has set back the options for high speed Broadband in West Chiltington? All we asked for was sufficient demand to warrant the local relay, you turned that into “it is too expensive for Kijoma to bother” on the forums (after you banned me from it after 1 post). The Map is WSCC’s current map, based on their particular poor survey data last year, it specifically excludes Kijoma coverage . Kijoma is a 12 year old West Sussex based business, yet the people I/we pay to govern this county continue to ignore the service provided and as such deserves to be questioned until answers emerge. Samknows , like many other sites, uses exchange area and coarse post code data. It is not optimum for Wireless as of course signals do not obey Exchange coverage areas and can exceed or due to terrain etc.. not reach those boundaries. You will have to remind me what trade you are in that refers to it as “sam doesn’t know” ? I do agree the money is going to be spent unwisely based on current BDUK policy, i suspect they will spend it all before they realise though and then the cycle continues all over again . A bit of Deja vu from the ADSL situation at the start of the century perhaps?, West Chiltington was after all a victim of that ). As for Ewhurst, As i posted before, This village has coverage for Kijoma. another narrow minded individual formed a group over there to chase the fibre dream. unfortunately it did not work but on the way he spent much time making sure people did NOT sign up to Kijoma, even to the point of lying profusely about our current customers there (such as the Duke of Kent School). They had to contact him directly to ask him to desist from his blatant slander, i have also done the same. We now have a fast increasing demand in Ewhurst , only three years late and with zero interest from Surrey CC (mainly due to the fibre campaigners valiant efforts to defame our service to his council associates). I am personally a bit fed up with the blind hate aimed at Fixed Wireless and Kijoma (as we are the only commercial operator in this area). Give kijoma a reason to provide you a service, talk to us as you would any company you would like a service from. Then maybe we will get somewhere. Where does the 22% Ewhurst figure come from? Let’s try again. Your exchange location for SDWSTCH on the map is over 20 years out of date. It just is NOT there! It moved in 1991. BT’s location data is correct, yours is not. No-one (including BT) can understand where you get your stuff from. Most other ‘information providers’ have it right. While we are there, and continuing the question of ‘why is the NGA data unreliable’, there is good quality coverage of 70% of the Isle of Wight at speeds up to 40Mb by click4internet, who have repeatedly asked you to include them, both there and their services in Hampshire. Again you have not responded. Interestingly, it appears from the Isle of Wight Council website that they are also ‘unaware’ of this and are pressing for government money since ‘over half the island can only receive less than 8Mb’. Makes you wonder? 22% in Ewhurst is based on the provision of the ‘first’ 100 pair ‘Infinity’ cabinet to serve 450 connected pairs. Do the maths? They will be struggling, I think, to hit ‘90%’? As I said, someone tell the story about the King’s New Clothes – please? Mike – Without wanting to get into debate on a forum, I have replied to your emails previously, and I’ve just sent you another reply, which includes my previous reply. I have also been in communication with Lisa at click4internet whom I’m sure will be happy to share our communications with you. So SDWSTCH is a virtual exchange, are there any others? So you base publicising a 22% figure on some dodgy maths! Maybe BT base the sizing on predictions from the ISPs who will be selling the service. ps i am nothing to do with SamKnows, just interested. Mike – as you know the 22% figure means nothing if you are just saying it is the intial FTTC sizing of 100 connections out of a possible 450. Is this a scare tactic for the locals? Presumably the ISPs calculate expected take up. Best would be to ask the WordPress geniuses if you can’t find one in the support section.